Enter Rome at the time of the slave uprisings under Spartacus! The escaped rebels have managed to gain influence and power. Rome is attempting to undermine the stronger armies of the slaves in order to restore PAX, or peace – but only for personal gain. Will the Empire collapse under the strain, or will their promises to insurgents succeed in drawing them to their side? 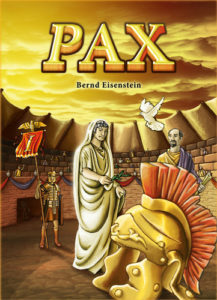 The players play the part of the escaped slaves who try to increase their sphere of influence and undermine the Roman establishment. Using their cards, they expand their power in seven different categories. At the end of the game, each player tries to be stronger than Rome – and, of course, stronger than any opponent. Or, through intrigue, a player can join forces with Rome and thus share its victory over the slave revolt. Game components are language-independent. German, Engllish and French rules included. » German rules (1,9 MB). » English rules (1,4 MB). » French rules (1,0 MB). » Dutch rules (1,8 MB). » Japanese rules (2,5 MB). » Portugese rules (1,2 MB). » Hungarian rules (4,3 MB).